View More In Portable Power Banks. This Universal External Lithium Rechargeable Battery Pack laptop computers. 5V USB port that can be used to power or charge cell phones, iPhone, iPad, MP3/MP4 players, PDAs and any device that can be charged from a USB port (USB power cable not included). Regular output port can provide 12V, 15V, 16V and 19V power through included special output cables . 3. Has its own AC charger and can be charged from 100V ~ 240V AC power source. 4. Comes with 12 popular interchangeable connector tips compatible with many Acer / Asus /Compaq /Dell /HP /IBM / Lenovo /Samsung / Sony / Toshiba and other different laptops/netooks/tablets. More optional connectors available from the BiXPower website. This high capacity ( 99 Wh or 27000 mAh) battery can output many different voltages: 5V, 12V, 16V, 19V or 24V . It can be used for many different devices such as Laptops, netbook, tablets, mobile phones, digital frames and DVD players. Battery output voltage is controlled by the special output cables come with the battery. 4 Output cables (a 12V, a 15V, a 16V, a 19V ) plus 12 interchangeable connector tips make this battery compatible with many laptops/netooks/tablets, LED lights, medical devices and other electronic devices. 5V USB port can be used to charge and power iPads, iPhones, and other mobiles. Long running times. For an iPad, add up to 30~40 hours of power. For an iPhone, up to 60 hours talk time. High Capacity: 99 Watt-hour capacity ( or 27,000 mAh if rated like other external batteries on market). Weighs only 1.8 Lbs. Compact size 8.5" x 5.5" x 1" inches ( or 220 x 145 x 25mm). 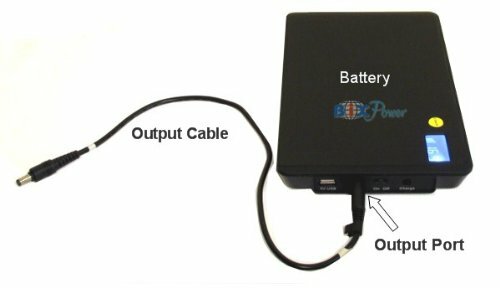 Package includes: 1 MP100 battery, 1 AC charger with power cord, 4 output cables ( 12v, 15V, 16v, 19v), 12 connector tips. If you have any questions about this product by BiXPower, contact us by completing and submitting the form below. If you are looking for a specif part number, please include it with your message.